A lot harsher than I would have guessed, including four additional scholarship losses for the football team (on top of the five self-imposed scholarships taken away. But, of course, most of all, Ohio State is banned from postseason play next year, including the Big Ten championship game and any additional bowl game. The 'repeat offender" clause comes into play here, as the 2006 and 1994 basketball infractions definitely affected the decisions. 1978 and 1957 football infractions are mentioned also. You can read the entire findings at this link. I still maintain that the vast majority of the blame here falls with Jim Tressel. Yes, there were actions by players that led to the trouble (selling merchandise and receiving free tattoos, mainly). 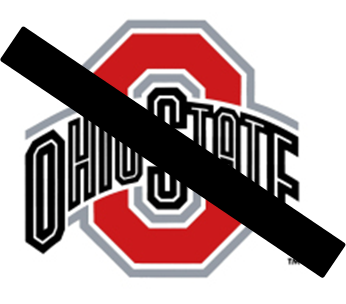 But the action, or more accurately, inaction of Coach Tressel is what has led Ohio State to this sad day. And I had really thought the self-imposed punishment, including complete vacancy of all wins in the 2010 season and ouster of Coach Tressel, would have fit the crime. Apparently not. "The Game" is 340 days away. Hopefully all the recruits who came to play in Scarlet and Grey still want to suit up for new coach Urban Meyer, and they don't mind that being the last game of the year. I wish the Buckeyes could just forfeit the bowl this year, but...too much money is at stake.